Couponing can seem very overwhelming at first but it doesn't need to be. TAMPA, Florida — "The first thing I panicked about was diapers. This kid has to wear diapers. How are we going to pay for diapers?" said Elizabeth Baker. Baker started couponing when she found out she was pregnant with her first child. 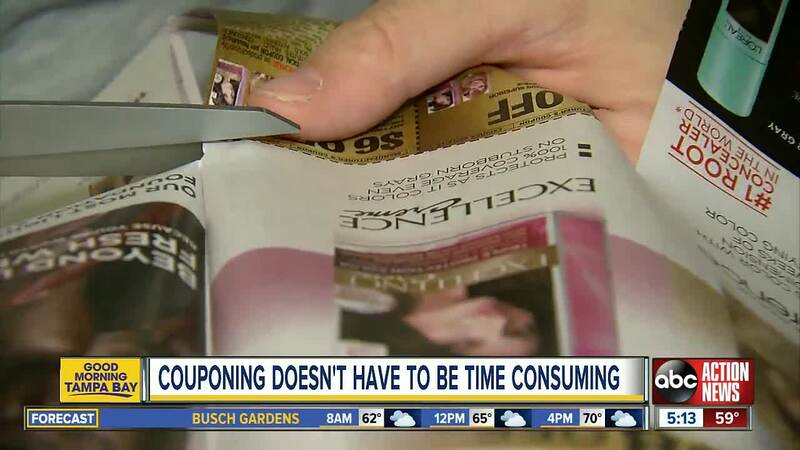 She says if you have never tackled couponing before, it can seem very overwhelming, but it doesn't need to be. She says start small. "Just pick one thing. Like for me, it was diapers," said Baker. Baker suggests picking something your family uses often: toiletries, paper products or non-perishable food. "I am really passionate about toilet paper and how expensive it is full price," says Baker. As a busy mom, she knows time is valuable. "I don't spend a lot of time looking at store ads," says Baker. "I look online and go to the couponing blogs that do it for you. I just look at what they say to buy that week." Those bloggers break down store sales and regular coupons. "It's absurd how cheap you can get it [toilet paper] by just combining coupons with sales," says Baker. Also, do not go crazy buying the same products every week. Baker suggests purchasing enough to last you three to six months. The family saved at least $2,000 on diapers alone. "You see how many moms are majorly struggling with just trying to pay for mom life and to pay for the food, diapers, and formula"
Baker now coupons to help stock shelter or pantries. "Everyone who is going into a shelter is obviously hoping for a shower and is hoping for those toiletries. If I can get them for free, then why not?" said Baker. Click here to check out one of Baker's favorite coupon saving websites.